University of Tokyo physicists have discovered a new way to generate electricity in special materials called Weyl magnets. The method exploits temperature gradients, differences in temperature throughout a material. The technology could offer new designs for maintenance-free remote sensing devices or even medical implants. The team’s research paper has been published in Nature Physics. The Anomalous Nernst effect in manganese-tin alloy Mn3Sn. 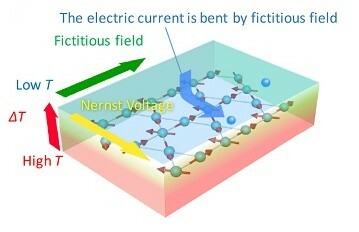 In the anomalous Nernst effect, the electromotive force is generated perpendicular to both the magnetization and thermal gradient. Image Credit: © 2017 Takahiro Tomita, University of Tokyo. Click image for the largest view. What is this anomalous Nernst effect and how could it lead to such a great leap forward? This is similar to a more established phenomenon called the Seebeck effect, which is responsible for power generation in thermopiles, the functional components of thermoelectric generators. These are used in deep-space probes like Voyager and New Horizons, amongst other things. With the Seebeck effect, the voltage is generated between the hot and cold regions of the metal in question, so it’s parallel to the temperature gradient. The anomalous Nernst effect however generates a voltage along the length of a magnetized piece of metal, perpendicular to the temperature gradient. The researchers observe this effect in a special kind of metal (Co2MnGa) known as a Weyl magnet. This provides the first clear evidence for the existence of Weyl fermions in a material, elementary particles which give Weyl magnets their unique properties. And there are important practical implications. The devices are much simpler than those used for the Seebeck effect, thin films as opposed to pillar-like structures thanks to that perpendicular rather than parallel voltage. So they are flexible and can be made into a variety of useful shapes. There is a catch however, in that the method usually produces about 0.1% the voltage of the equivalent Seebeck effect system, about 0.1 microvolt compared to 100 microvolts, so we might not see this technology in space probes anytime soon. “However, we aim to make our method comparable with the Seebeck effect in terms of efficiency,” said Nakatsuji. “And even before then, given the other advantages, this technology could see rapid widespread adoption.” Since the discovery of Weyl magnet thermopiles in 2015, which exhibit the anomalous Nernst effect, there has been a thousandfold increase in their power-generating efficiency, with this recent finding alone observing 8 microvolts per Kelvin, a whole order of magnitude increase over the previous maximum reported value of about 0.1 microvolt per Kelvin. This team deserves the congratulations a new discovery merits. Its very early indeed for this technology, but the starting gun has gone off and the Japanese tendency to miniature so many things is sure to provoke ever more development. There is sure to be more new things and these technology may well may many new idea possible someday.